Books and videos owned by the Library. Renew Items. Find magazine & journal articles and ebooks & full-text encyclopedias in online databases like ProQuest. Log into the RTC databases from off-campus using your Email Address and Password. Type in your student or employee email address, yourUserName@student.rtc.edu or yourUserName@rtc.edu, and then type in your password. Useful links for students, faculty, and staff, listed by subject and by name of program. Or go directly to the LibGuides home page. Library hours, services, and staff. Also information about other libraries. Not sure where to start on a research project? Get personalized one-on-one research assistance with a librarian. A listing of what is on the Library web pages. Need help? If the library is open, you can call us at (425) 235-2331. 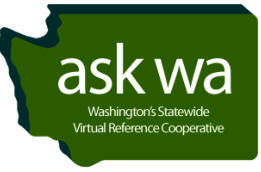 Or you can click on the "Ask WA" logo to the left and find out how we can help you find answers from home.